It’s fairly common for universities and government agencies to have a network of steam pipes (such as the ones that feed the state government buildings), and NCSU is no exception. 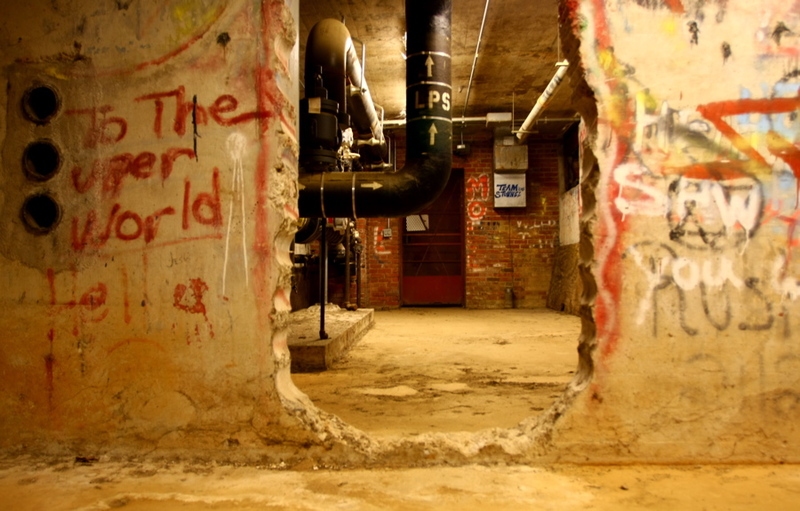 I’ve heard about them off and on over the years, and have always been intrigued by the thought of a subterranean network of secret tunnels, rooms, and machinery hidden below the surface. 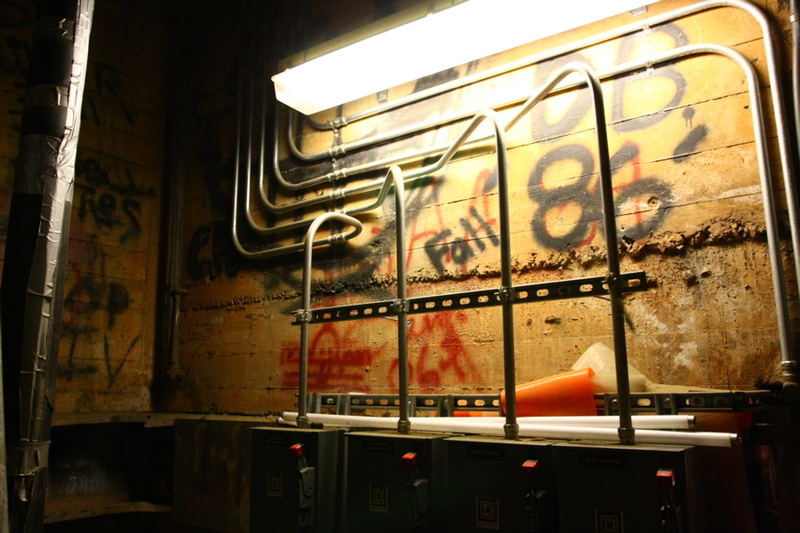 Despite the number of words left on walls in the photos here, most of the network consists of nondescript pipes and passageways connecting various parts of campus. There are several stenciled works denoting various groups that have traveled here over the past few decades. The earliest date I saw was 1985 as seen in the stenciled piece above, but I’ve been told there are some that date back to the 1950s. I’d like to give credit and thanks to uliveandyouburn for showing me around this surreal and hidden network. 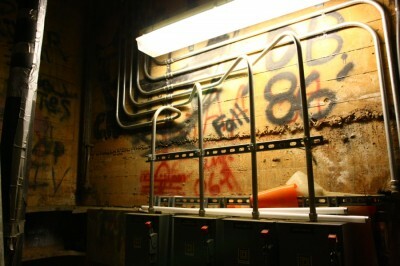 UPDATE: For more photos of the the Steam Tunnels, check out Part 2. This is just awesome, John! 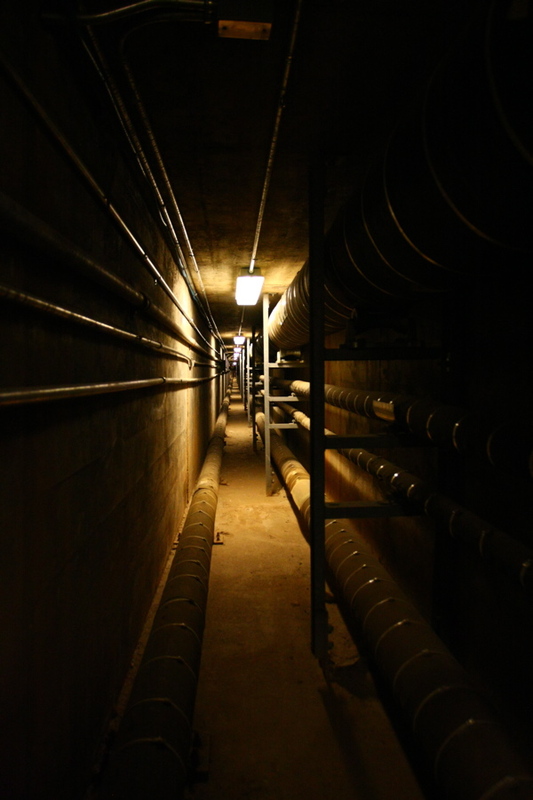 Getting into the steam tunnels was one of the first campus “urban legends” I heard about when I came to NC State as a freshman in 1969. And I’ve been trying to find out about them ever since. I love that graffiti! Great photos, good job! Interesting. When I was at another University in the mid 70s I had a student job where I was able to access the tunnels. I had also been intrigued by the notion but mostly they are dank wet musty places with no real excitment. Besides steam they also channel chilled water for the A/C and shuttle your electricity, telephone and internet … cable sometimes too all across the campus. Just be careful that you don’t trip into one of those 13,000 volt panels that ominously hum as you pass them (especially since the floor in front of it is probably wet). THAT might be exciting. Just remember, they are restricted because they are not safe places to hang around in when you don’t know what you are doing. My name is still there these years later! I used to be an engineer for the school (responsible for the utility piping) and I’ve yet to be in a more hot, humid, and stanky place during the summer – just be careful down there, it’s definitely not all that safe since some of the steam pipes are ancient. There was so much dust in there that I had to get used to walking with my eyes closed. I could literally walk from the steam tunnel all the way to Nelson without opening my eyes. Luckily though, they’ve renovated the piping in recent years and redone the lighting. I think it’s neat to observe the different years through a backdrop like this. Industrial archaeology, almost. thefensk – I did notice a few humming panels, and steered quite clear of them. Although ‘excitement’ isn’t the word I would use, it was certainly a thrilling experience for me. It was dead silent, with hidden doors and passageways that connected all the parts of campus I had walked over hundreds of times. I certainly enjoyed it. Mullman – can you tell me just how long ago you put your name up? Cackalaki – yes, it was quite an intense experience. Several areas of insanely humid hot air, with peppered bursts of cold air here and there. It was surreal and quite a unique experience. I was exceedingly careful not to trip into one of the pipes… 1,000 degrees of steam to the face is not a good way to go out. thanks for the comments and information. Fall of 1989 or possibly Spring of 1990. A group of us would go very regularly and explore. Dates from the 60s-70s could be found. wow. we used to sneak in by the library’s lower-entrance and walk down to the “cool room” at the end of the main north/south tunnel. the room is directly south of the free expression tunnel and lies just adjacent to the bookstore. This was an important gathering place for a branch of the Masters Of Deception, made up of cyberpunks and hackers in the late 1980’s that hasn’t been documented. I traveled the steam tunnels 3 or 4 times in the early 80’s. We went all over the place. 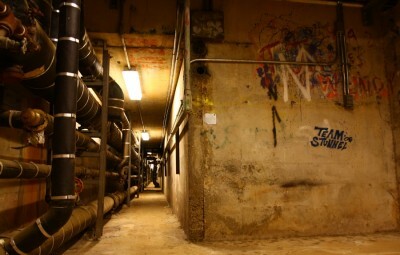 The tunnels actually came up into a box in my dorm room in Syme (but you couldn’t enter there). We went all the way from Syme to DH Hill, to South campus by the smokestack, and everywhere inbetween… One of my best memories of NCSU. does anyone know the exact locations of the entrances? Reminds me of the final stages of Portal. I keep expecting the graffiti to include a crossed-out pictogram of a cake. Kurt Eichenberger (now a Raleigh architect) somehow discovered some entrances to the tunnels about 1970, and he and I had some adventures down there about that time. He probably remembers where those entrances were (hope he doesn’t mind my mentioning his name, and hope we don’t get busted!). As I recall, we entered somewhere around Syme or Welch and were able to go under the railroad tracks to somewhere down around Thompson Theater. I just took my 8 year old son and 5 year old daughter on a tour of the campus. The only thing they wanted to hear about was my adventures down in the steam tunnels in the early 80’s. I took them to the free expression tunnel and showed them a door ( now welded shut ) that led into the tunnels. There are also manhole covers in the middle of the brickyard that lead down. You could get in at Syme dorm. There was an entrance at the west end of the building that went down under the parking lot. You had to go through the main steam plant and sneak under a grated platform that had people working 24/7 keeping the plant operating. I don’t know how we survived because we were usually fairly altered when we went down. Allen thanks! We just went and explored the tunnels and they were amazing to say the least! We went in near Syme and came up on the other side of the train tracks. Simply incredible. I never knew State had such a secret. Does anyone know of anything similar to explore? I just got back from these tunnels for the first time as well. I think it is something that should be done with caution but if you do go it will be a very neat memory to have. How many students out of approximately 32000 experience campus from beneath? Funny! I was just telling my friend about my journeys down there just last night. I also added that I hate that I never took any photos while down there. Thanks for the article and images. Good timing! Anyone that has been down recently want to reveal an entrance? Just spent about 2 hours with some buddies looking for an entrance on campus without much luck. I dont know if you should post it here or it may quickly get closed/locked or have way too man people using it, feel free to email me at modderplanet@gmail.com. …Are you the real Chris Pritchard? LSD and the steam tunnels. Good for a trip or two. No one else remembers the name Chris Pritchard? I highly doubt that was the real Chris Pritchard who posted that, but if it is, I want to hear more from the man who knew those tunnels best. I am really interested as well in finding an entrance to the tunnels. If anyone has been there recently and knows of an entrance please email me! Zach.McRae.@gmail.com. If I make it down there i will definitely post pictures, so if anyone wants their historic graffiti names photographed email me too and I’ll send you the pictures. I had friends who lived in Turlington. There is a grate covering an entrance to the steam tunnels in one of the flower/tree planter areas on the Turlington quad. We used this entrance regularly to traverse the tunnels to the other side of campus and to Hillsborough Street. The look of bewilderment on the faces of people milling around the quad when we popped up out of the ground was priceless. 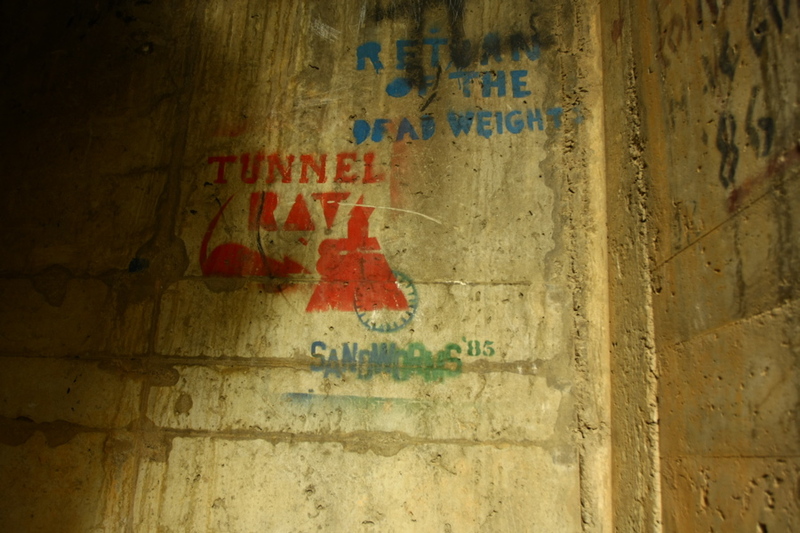 People who used the tunnels were “tunnel rats.” You had to watch out for “head busters,” mostly pipes and valves that had an uncanny knack for being at head level as you turned a corner. A couple of the more notorious head busters had been labeled by previous tunnel rats with red spray paint! As mentioned above, it’s dank and dirty, but lots of fun. My experience there was in the early 1980s. Regarding my post above: Make that late 1970s to early 1980s. Video of people exploring them! I am interested in the entrances. Also has anyone mapped out these tunnels or have the blueprints or anything? We went in through a grate on bookstore side of free expression tunnel in the middle of a big planter — might be gone now with all the renovation. Pretty lame but we were drunk and when do you REALLY ever get to use bolt cutters? We got busted coming out over near the smokestack across from ed/psych building, taken to public safety office & put on double secret probation until end of semester. All in all, very disappointed we didnt play D&D down there & sacrifice someone. Oh well. I was a Tunnel Rat in the 80s and we memorably encountered the Sandworms at The Door, which was in the tunnel that went near the biology building, if I recall. It was at the time an expellable offense to get caught down there and there’d been efforts to catch us before, so we crept up to the blind spot of The Door with our little flash lights. I reached out to open it when it opened by itself, and for a moment we were all completely fucked. Then a face appeared, equally shocked for a long heartbeat. Then he said ‘Sandworms!’ and I relaxed and said ‘Tunnel Rats’. We had a little confab right there, and swapped notes about the entrances we’d found. Little known historic fact – the leader of the Sandworms at the time was the NCSU student body president, nice guy I met at The Door. Pretty neat to read these comments as a current junior at NCSU. NCSU history has been a passion of mine and its neat to see all the former “tunnel rats” that adventured through these before I was even born. From what I hear/read/am told now, they have put the tunnels on lockdown. Motion sensors are everywhere down there and you’d be well on your way to getting expelled if you scurry through them now. 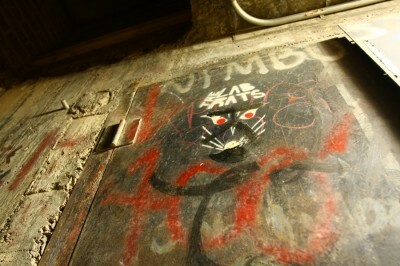 Also, the door entrance at the free expression tunnel looks as if it hasnt been opened in years. I would honestly be surprised if they could open the door now with all of the layers of paint covering it. That and talley renovation now has probably altered some of the entrances. The door in the free expression tunnel was pretty much painted shut in my day too (late 80s) but could be forced open after turning a little latch on the inside. We had to pile out of it one day when public safety tried to trap us in. We were never sure if someone had betrayed us but that night we were VERY nearly caught, and they sure seemed to be waiting for us. We popped up out of the manhole behind the library (which used to be somewhat concealed in bushes) only to find the place RINGED with PS. Back down we went (while they tried to figure out how to get the manhole back off) and we made a beeline for the closest exit, at The Phone Booth near the zoology building. We crept up on that sloooowly and heard them outside, waiting for us. Back we went and had to decide between the Big Grate (near Alexander and likely monitored), the Back Door (opposite parking structure near Reynolds), or force the door in the freedom tunnel. We weren’t even sure it’d open but it seemed like the best bet. Took a bit of forcing but we made it out, and we walked right on past the Big Grate, and waved innocently at the mass of campus cops waiting for us to pop out there. Close call, that. 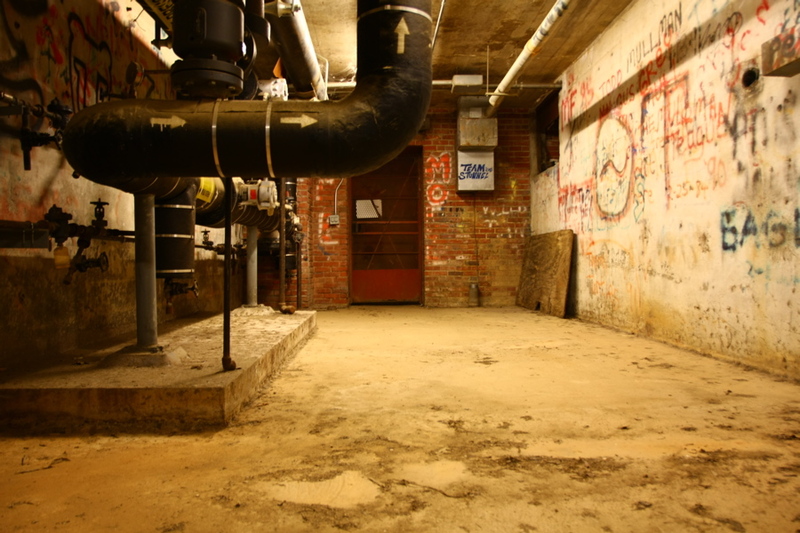 The tunnels were, as you see, ostensibly ‘on lockdown’ even back then although the lock on the grate near the old bookstore (which has now been totally remodeled – it was right off the end of Alexander Dorm) seemed to disappear regularly. We made it a point to never clip the lock on the same night we were to go exploring, one of the many ‘security procedures’ we’d set up. If they have motion detectors now – sounds like you’re screwed. Too bad – had many a fun night creeping slowly, heart beating hard, under the open spot beneath the physical plant. Fun times. Can somebody explain more about this Sandworm and Tunnel Rat thing? It sounds super neat! There may have been other groups that called themselves ‘Tunnel Rats’ but we were just a loose group of bored undergrads. Can’t say I remember where the name came from – maybe we read it on the wall, maybe not. There were other groups active but we rarely met them – going into the steam tunnels was supposed to be instant expulsion so we didn’t advertise. I’d hear rumors of other groups but until we met the Sandworms at The Door, I’d never met any. It was a fortuitous meeting. Jim Something-or-other, the student class president at the time, knew a lot about tunnels we’d barely ever seen, and we tried to prospect every grate and door we found. We swapped info and he and I got to be familiar acquaintances. I recall that we once conducted a joint operation (we took this all so seriously, given the possible consequences) and I was surprised at how similar our methods were. Both groups had pre-arranged bug-out procedures concerning where we’d exit if someone came, and where we’d meet up again. In practice, this meant abandoning stealth and just pounding out as quickly as possible to the nearest exit. I seem to recall that their equipment was a bit fancier than ours. We favored dim pen lights that only stayed on while you held down a button, and we each carried two. They had nice lights, which to my eye were a bit bright and hard to conceal quickly. We brushed up against other groups but I can’t say I remember much about them. There were a group of four of us that explored the tunnels in the mid ’70’s. Back then the big vent fans around campus gave them away – blowing hot air even in mid winter. There was one by Nelson, several by the tunnel at Dabney and Cox, and a big open fan behind Riddick or Mann . . that one was sort of scary to walk under. Seems like we usually got in in the courtyard by the dorms near the free expression tunnel. At some point we had a pretty nice map of the tunnels drawn up. Good memories . . after hours activities. Another favorite was ringing the old bell on top of Withers Hall . . a motorized beauty but sadly gone now. i wall in the deep web kann you help me? My roommate and I, and others, explored the tunnels in the early to mid 1980s. Entered at the Free Expression tunnel. Some much younger co-workers had never heard of them. I though everyone know about the steam tunnels! I guess with tighter security, there’s less exploring of these kind of places. A friend and I also scaled the radio tower on top of the library one night, just to touch the blinking light at the top. We explored the tunnels in the late 70s. You could enter by the door in the Free Expression Tunnel and travel all over campus. Memorable pop-up spots included in front of the old Student Union (Library) hidden in the bushes, also through an above-ground metal box with door near Nelson Hall, and a street level entrance near the smokestack. They were just like the tunnel entrances on Hogan’s Heroes. None of these were locked, and while we wanted to be discreet and unseen, I never heard it was prohibited either. Lots of people did it all the time. But today, there is no way I would do it.